Hello! I hope everyone had a fabulous week! I had a week that pretty much wiped me off of my feet, which is how I ended up, with my trusty Netflix account, watching Beverly Hills Cop. 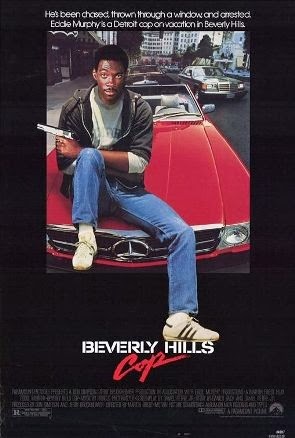 It had been forever and a day since I'd seen it, but laying there with my nutritional yeast covered popcorn (don't knock it until you try it), watching Eddie Murphy run around shooting people was exactly the therapy my soul needed. The man even makes a car break down by stuffing bananas in the tailpipe. Seriously, what more could you need? 1. 1980's film plots didn't have to make sense. No, seriously, as long as there was dialogue, some form of a climactic story-arc and inspirational sounding synthesizer music you could have written any plot and put it on the screen. And people did. You want a story about a kid who fakes being sick for a day then runs amok; avoiding his parents and the principal, destroying an expensive car and somehow managing to hijack a parade float? Sure! We'll give you Ferris Bueller's Day Off! 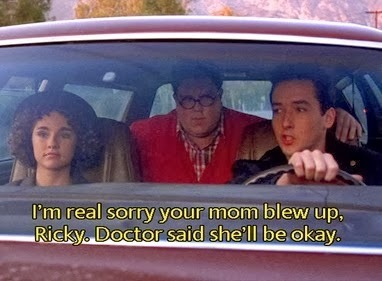 Just go watch Better Off Dead! There is something fantastic about watching a film that had a basic premise that someone just said, "You know what? Maybe we just need to throw a random scene where someone attempts to get high by snorting fully set Jell-o! Oooh! I know! Let's throw in a fanatical, and possibly psychotic, paperboy who will travel to the ends of the earth for two dollars!" And that is how 1980's film plots pretty much go. 2. Bad guys in the 1980's were completely ineffective at life. It always amazed me that villains in 1980's action flicks hired the most incompetent henchmen ever. With all the money they were shelling out to employ these losers, you'd think that requirement number one on the job description would be, "Can hold, load and fire a gun and be able to hit the broad side of Texas." Your generic 1980's bad-guy underling might as well be given a Supersoaker full of bubbles for all the good they did defending their evil overlords. It constantly confounded me while growing up that the bad guys would face off against the hero, empty countless clips and do nothing more than modify the scenery and possibly trim a topiary. Then the hero would step out and basically blindly fire, like the picture to the right, and every human being in a ten mile radius would hit the dirt. The only time a hero is actually shot is if it makes him or her look more tough, and half the time I think she or he had to jump in front of a bullet to get it to hit them! 3. People were extremely philanthropic in 1980's movies. Coolest High School Janitor Ever! Apparently it was normal in the 1980's for some kindly old janitor at your high school to take you in, train you in some random martial art and then give you a classic car. At least the kid in Karate Kid didn't seem overly surprised about this. It is also fairly common for a random old scientist to befriend local teenagers and allow them to play with their extremely expensive technical equipment, even when they blow the living crud out of it. After all, that's basically where the plot to Back to the Future came from. 4. The future was so much cooler in the 1980's than it actually turned out to be. Speaking of Back to the Future where are my flying cars and hoverboards? Also, I think my lightsaber is long overdue and I haven't even heard hints of magical food packets that we can stick in a machine and magically hot and delicious food will pop out. Come on science, get with it! 5. Heroes didn't have to be complex. While I enjoy my modern renditions of Batman and Spiderman as much as the next person, I also sometimes enjoy just watching mindless destruction at the sake of saving the world. Why does the world need saving? Umm... reasons? Let's face it they all had reasons to cause wonton destruction (90% of the time it was revenge), but normally those plot devices were kind of lame. A drug dealer attacks your buddy? 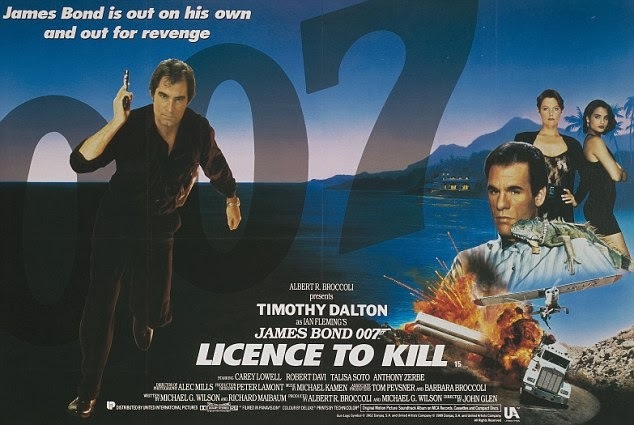 You turn in your license to kill and go wipe out the equivalent of the population of a South American country to get your revenge. You also must make at least one building explode and kill a maniacal mastermind. That's it, that's all you need to be a 1980's action hero. No deep, dark secret, no inner-turmoil or conflict. You just need to know you're the good guy, and they are all bad guys. 6. If someone ever needed to train for something, there was always a band nearby to play awesome workout montage music. How would Sylvester Stallone have ever survived Mr. T without his theme music? 7. Evil masterminds almost always defeated themselves with monologue. "Alright Johnny Goodguy, I have you tied to a chair and completely at the mercy of my amazing array of weaponry. Before I kill you however, I am going to explain every last detail of my nefarious plot, taunt you, read you my college dissertation and then show you a slideshow of evil kittens..."
I wonder how many times the world would have been destroyed or taken over if the evil mastermind had just cut out his ten-minute monologue and just shot the hero without further explanation? So, what were all of your favorite things about films in the 1980's? 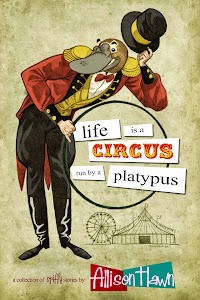 In other news, thank you everyone who put a bid in at the Washington Chapter of the Modified Dolls' auction for the signed copy of "Life is a Circus Run by a Platypus!" The auction raised quite a bit of money for the Not For Sale Campaign! As always, I can be found on Facebook, Twitter and Goodreads! It's just yummy and protein-y and not likely to make me gain ten pounds!